Annika Sorenstam's 70th LPGA title at the SBS Open was her first win since 2006. Annika Sorenstam wasn't sure if win No. 70 would ever come her way, especially after last year where she spent much of the golf season trying to overcome back and neck injuries that left her only a shell of her former self. But with yesterday's victory at the $1.1 million SBS Open, Sorenstam silenced those who whispered that her best days were behind her. She closed with a final-round 69 to finish at 10-under 206, two shots clear of Russy Gulyanamitta (68), Laura Diaz (70) and Jane Park (70), who tied for second at 8-under 208. On a perfect day at Turtle Bay Resort, Sorenstam birdied two of the final three holes to seal the deal and end a 17-month drought on the LPGA Tour. It was her third victory in the island chain. Her last came on the Big Island at the 2002 Takefuji Classic when Michelle Wie captured most of the headlines playing in her first LPGA event as a 12-year-old. The two will see each other again at this weeks Fields Open at Ko Olina where Sorenstam once again will be the player to beat. 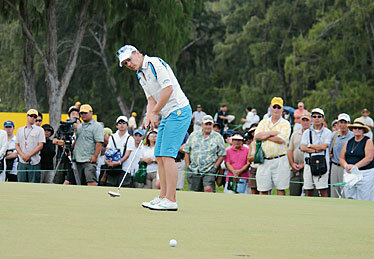 Annika Sorenstam watched her putt on the the ninth green during yesterday's final round of the SBS Open. The moment Annika Sorenstam's golf ball disappeared into the 17th cup for birdie, her fianc, Mike McGee, turned to a reporter and said, "That's the Annika Sorenstam I know." The one we all know walked off the 18th green with her 70th trophy after winning the $1.1 million SBS Open in dramatic fashion with birdies on two of the final three closing holes to card a 3-under 69 yesterday for a 54-hole total of 10-under 206. "I could not have asked for a better start," Sorenstam said. "We all have talked so much about '07. I think it's time to talk about '08. My clubs did the talking this particular week. I'm obviously very, very thrilled. It's great to win tournaments. There are some tournaments that mean a little bit more and they come at a special time. I would say this is one of them, as you know, for many reasons." She held off a trio of golfers who did their best to derail the greatest woman golfer of all time, but they just didn't have enough in their bag to get it done. Little-known Russy Gulyanamitta (68), Laura Diaz (70) and Jane Park (70) tied for second at 8-under 208 with a frustrated Angela Park (69) and Japanese sensation Momoko Ueda (71) tying for fifth at 7-under 209. Angela Park was in contention on the back nine at 7 under, before learning at the 11th tee that she had been flagged for slow play by LPGA rules officials on three separate shots at the 10th, leading to a two-stroke penalty that effectively knocked her out of contention. She cried foul at the scorer's tent, but there was nothing she could do about the ruling. She and her caddie, Mike Hobbs, said there were extenuating circumstances that led to the supposed slow play, including two golf balls nearly side-by-side in the bunker that took time off the clock, but their protest fell on deaf ears. "All she was trying to do was win her first golf tournament," Hobbs said. "And then we get to the 11th tee and we have to wait. It wasn't right or fair." Even if she had stayed on track, it would have been tough to halt Sorenstam's closing charge. From the opening hole, which she birdied on Thursday afternoon, to the closing par yesterday evening at the 18th, Sorenstam was the player to beat and the other 138 women in the field knew it. Battling neck and back injuries that kept Sorenstam out of the winner's circle dating back to the State Farm Classic in September 2006, the Swedish native conceded after the tournament that she played too tentative early on; trying not to lose, rather than win. She's been trying to get her 70th victory for so long, she must have wondered if it would ever come. But now that it has, her sense of relief was palpable. "Well, it's a big number," Sorenstam said. "I've had a few chances and I was able to do it. And to do it here in '08, it's like everything is coming together. It's pretty neat. I'm very happy. "My sister had a shirt that said 70. It's old now. She's had it for a long time (2006 Samsung World Championship); probably dusty. A friend of mine has a bottle of wine that says 70 on it. I'm ready to collect it now." She began her day with a missed birdie putt from all of 4 feet. She kept telling her future husband that the greens had changed since the first day and she was having trouble getting the right speed. That was never more apparent than the three-putt bogey she managed from only 18 feet at the par-4 11th. Had Ueda managed to sink a 6-footer for birdie, the two-shot swing would have put her in a tie for first with Sorenstam, but it wasn't meant to be. She missed that putt and another short one for par at 17 to keep her from drawing even. Ueda did sink a 35-footer at 16 to drop to 8 under for the tournament, but Sorenstam wasted little time covering her up after sinking a 6-footer to fall to 9 under and keep her one shot removed from the field. But the shot of the day was the 24-footer for birdie at No. 17, a hole she double bogeyed on Thursday, but refused to let it get the best of her yesterday. "It was huge," Sorenstam said of the dagger putt. "It was one of those putts that I'm going to remember for a long time. I mean, it's nice to have a one-stroke lead going into 18. But to have two, especially when it's a par 5, a lot of players had birdies. Coming back like this, it's nice to have an extra cushion. So that was key." Now, it's on to the Fields Open at Ko Olina with Sorenstam in the field again. Can she make it two in a row, similar to what Ernie Els did when he began 2003 with back-to-back wins at the Mercedes and Sony Open? Nobody's betting against her, particularly her husband to be, who was taking pictures in the media room to capture the moment. "It's so big for her," McGee said. "It makes all those early wake-up calls worthwhile."